The local inhabitants, predominantly Khoi San, moved their livestock around along animal trails, often those not normally synonymous with the region, as an example, elephant paths. But with the development of trade and the expansion of farming, the need for roads to the farmlands grew, and with this so did the need for effective and safe crossing of the various mountain ranges. The history surrounding our passes is fascinating, but the need for the road network has not changed since those pioneering days. Our road network is still an integral part of the region’s economy, perhaps more so now than say thirty years ago when the railway system was still the main mode of transporting merchandise. And an integral part of the road network is the Mountain Passes. There are an estimated 490 Mountain Passes in the Western, Eastern and Northern Cape. Most are no longer in use, some difficult to distinguish, but each was and still is homage to the region’s growth and development. The Western Cape's Mountain Passes are objects of great beauty. That they are mostly engineering feats, both modern and historical is undeniable, but their outstanding attraction is the sheer beauty one experiences when crossing any of these passes. Therein lies the essence of the Mountain Passes. In the days of yore, when travellers transporting their wares crossed these passes, speed was never a consideration. The safety of the travelling party and their animals was paramount. They did not live in the future, as we modern inhabitants of this beautiful Earth are so wont to do. We rush around in our daily lives, mesmerised by time, with half an eye on what we are doing and the rest on what we are about to do. When we place ourselves behind the wheel of our vehicle, be it an SUV, a luxury sedan or just ‘old faithful’, we’re obsessed with arriving at our destination safely and preferably as soon as possible. And so we cross one of the most beautiful pieces of Earth, the Western Cape, focussed on the destination, the piece of tarmac in front of us, and the completion of our journey. The sheer beauty of the vistas on display is often lost in a mist of irritation and anticipation, which accompanies the modern road trip. In our results driven world, the end is all that matters and the joy and splendour of the trip is lost along he way. What if one stopped along the way? What if we savoured every bit of the trip, perhaps not metre by metre, but perhaps section by section, view by view, or even just pass by pass? The object of this site is to alert the reader to the beauty of the Western Cape and it’s awesome Passes. Not just the Passes, but also the Scenic Routes, which help the Peninsula in particular, express itself in all its splendour. Then there are the Poorts. A Poort is a path through a range, which normally runs alongside a river, and the Western Cape has some breathtaking Poorts to offer, such as Meiringspoort and Seweweeks Poort. None of this means a thing if the object of the trip is the destination. The destination is secondary. It is the journey, which is paramount. The journey has to be savoured, stopping at the view sites, or for coffee at a farm stall, or tasting some wine at the various wine estates and farms. In fact visiting the Cape Mountain Passes is a journey of its own. It is not part of an itinerary, it is the itinerary. So we invite you to travel around this site, learn a little about the Cape Mountain Passes, and plan your trip to savour the beauty of the Western Cape, in your car, on a motorbike or even by bicycle. Let your destination be where you find yourself and not where you aim to be. 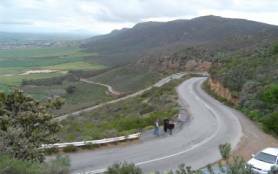 In the development of tourism routes in the Western Cape one comes to the conclusion, that with few exceptions, each route includes a mountain pass poort or scenic drive. Our magnificent mountains, which we all admire and take for granted, straddle the wide-open spaces of our beautiful hinterland. It is this space and rugged beauty that our modern day tourists are finding so attractive and interesting. One simply cannot travel from one part of the province to another without having to cross one of the many Cape Mountain Passes. Over 490 passes have been identified. They vary from those established by the earliest Koi San inhabitants to the modern day freeways. Of these approximately 50 are in use today. Many of the new roads have been built over or cross the older passes. Some have been completely overgrown or destroyed. The early road building pioneers like Thomas Bain and others are well known and acknowledged for their engineering achievements. However we have failed to recognize the role of ordinary and previously disadvantaged people have played in the pioneering and development of the Cape Mountain Passes. One of the main aims of this project is to address this issue. We need to acknowledge their role, often under sufferance, and place it in its right perspective. We salute the great engineers and politicians who were responsible for the passes we enjoy today, however none of this would have been possible without the innate knowledge of the early inhabitants of our land. Likewise the contribution of the workers that toiled, often-in harsh conditions, in the construction teams of various mountain pass projects over the years. A number of these teams were made up of convicts or prisoners of war. Traditionally passes and ports were built and have been maintained for commercial or economic reasons with scant regard for their historical or tourism potential. Poor road signage and information about passes discourages motorists from exploring the different passes and stopping to admire the road engineering, magnificent environment and scenic views on offer. The Cape Mountain Passes project is to address these issues and develop a unique tourism product which will benefit the growth of tourism in rural areas.